One of the most common damselflies in the northeast, Slender Spreadwing is only found in the northern parts of the region. It has an unusually long abdomen and distinctive pale blue antehumeral stripes. The eyes of the male are blue. The rear of the head is black becoming pruinose at maturity. The antehumeral area is black except for a pale blue middorsal and antealar carina. There is a pale blue stripe on the lateral quarter of the mesepisterna that extends on to the dorsal edge of the mesepimeron. The rest of the mesepimeron is black. The remaining lateral and ventral areas of the pterothorax are pale yellow becoming slightly pruinose with age. Each femur has a black line running its length on the outside. The tibiae are nearly all yellow with a black line only apparent anteriorly. Abdominal segments 1 and 2 are black dorsally and pale yellow or blue laterally. A dark dorsal line on segment 2 narrows at its middle to form 2 distinct spots, but this can be obscured in older individuals. Segments 3-7 have a dorsal stripe lighter, more tan or brown, and only slightly darker than the lateral pale areas. Segments 8-10 are black dorsally and pale yellow laterally. Segments 9 and 10 darken with age so only the pale yellow apical and basal rings remain. 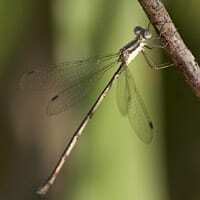 This is the only spreadwing in our region with paraprocts distinctly and strongly curved downward. The color pattern of the female is similar to the male, but the abdomen is uniformly black dorsally and tan laterally. The black of the antehumeral and metepisternal areas is less extensive than in males. Segments 9 and 10 are pale laterally becoming darker ventrally. The posterolateral corner of the ovipositor’s basal plate is acute, generally forming a distinctive tooth.